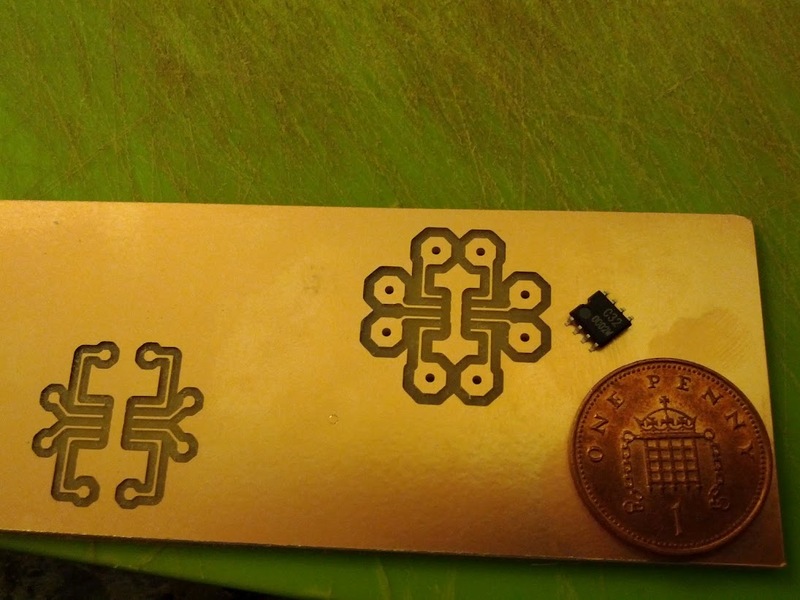 I’d decided that I’d had enough of nasty stripboard creations and would make my own PCBs. Designing and sending off to somewhere like Seeed or BatchPCB seems Ok if you’re based in the US and have a use for 5 or so boards, but most of mine is a one-off and nowhere seems to do a reasonable price if you’re in the UK. That and I’m too impatient to wait 2 weeks for a board. I was looking into laser printer toner transfer and etching but then stumbled across some CNC mill conversions that seems doable and not too expensive. The main one that caught my attention was http://www.jarkman.co.uk/catalog/cnc/mf70.htm but there are plenty more linked from there. He was very helpful and gave me a few pointers. The MF70 seems like a great price as a manual mill. I paid about £270 and budgeted about teh same again to convert it to CNC. 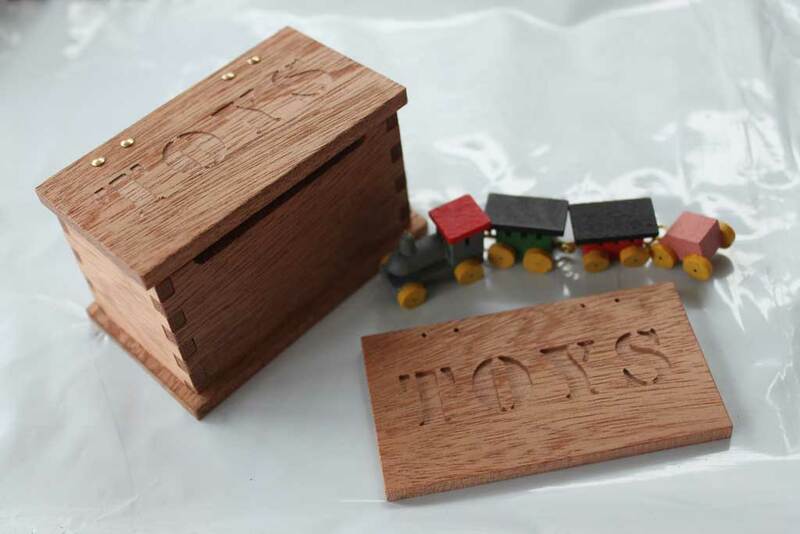 Ready made CNC systems seems to be thousands. I decided to make things as easy as possible for myself. I bought a nice stepper motor mount kit on eBay from a seller called *mbbilici*. All very nicely made as you can see from the photo. I’d thoroughly recommend this kit for getting started quickly. I also bought a kit containing 3 stepper motors, a PSU and a TB6560-based stepper motor controller board. Just after I got this I discovered how much hassle some people have had with the TB6560 boards. To be honest mine is working fine but you can read about other people’s troubles here so I can’t really recommend it. I suspect I’ve been lucky. It’s probably best avoided and I intend to replace it when I can. Well, here’s the finished product. Nothing too different from every else’s conversion, but it’s exactly what I was after! It still needs a bit of tidying – neater wiring, limit switches, etc. I’m sure I’ll be tweaking and adding to it for a while to come. The “standard” way to control CNC stuff is using Mach3 software running on a PC and communicating with the stepper driver over a parallel port. My brother had a suitable PC lying around, so I decided the quick and easy approach would be best. It really does feel like a solution out of the 90s though – especially when you see the nasty UI for Mach3! It reminds me of the old Visual Basic days when everyone had red and green buttons. Truly horrible. But it works well for now. On the design side I can thoroughly recommend CamBam. Very easy to get started with and very professional. Nothing like Mach3. Well, it may not have been the most adventurous of conversions, but I was up and running within a week or two and carving random chunks of wood. 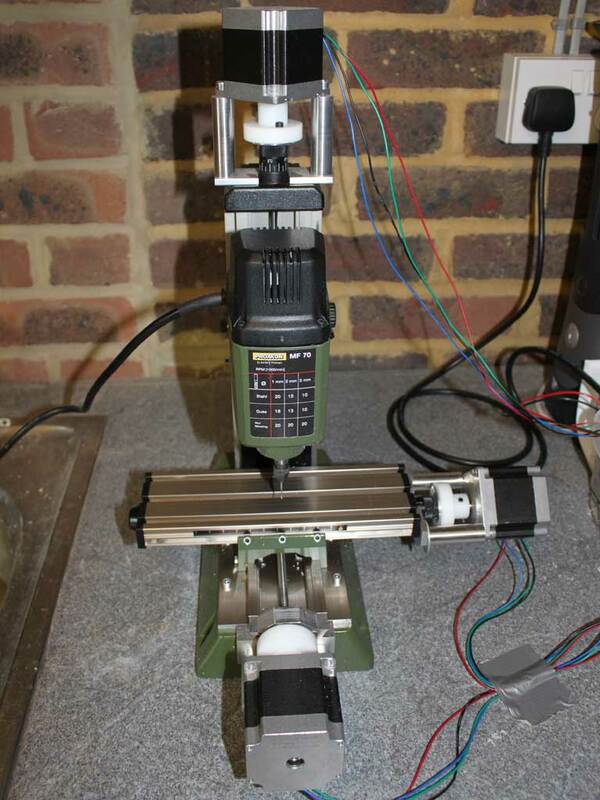 With a few more peices of software – Cadsoft Eagle for PCB design and PCB-gcode to convert this into instruction for the mill, I was turning out some PCB and surprising myself with the accuracy of this little mill. The photo is of a SOIC breakout board that I made for a friend. I was using a 1mm bit which was far to large for the job, but I was still impressed with my first attempt. My wife wasn’t too keen on my new hobby, but saw some benefit to it once we’d designed and made a toy box for my 4 year old niece’s dolls’ house.